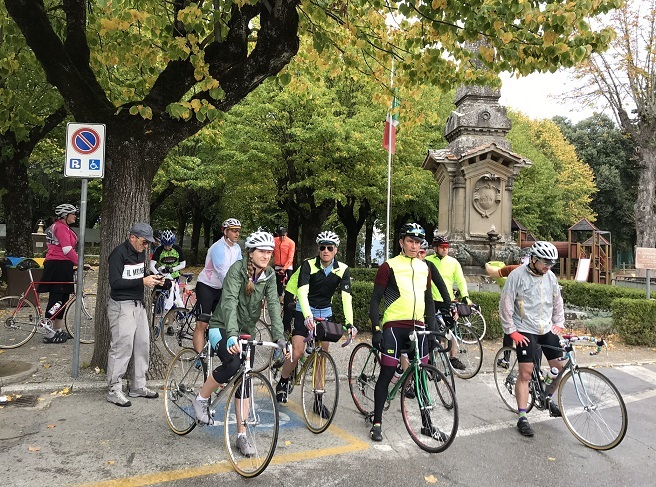 Last time, I promised to tell you all about our Ciclismo Classico bicycle tour in Italy, besides just the amazing food and guides and lodging and cappuccinos. 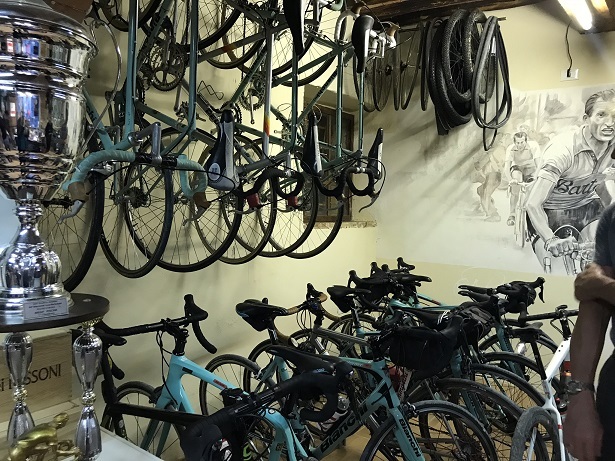 Here’s the bike garage at Il Mollinello, our guide Sandro’s home / B&B / 14th-century gristmill. First, let me say up front that this jaw-dropping wonder world of bikes absolutely could beat up the bike garage at our house. I think I saw Brent taking notes. The rides started out pretty easy–at a casual pace, too. Here, Brent is uncharacteristically taking time to stop and get a photo. That’s as opposed to his usual technique of taking them one-handed, on the fly, with sometimes less-than-graceful results. 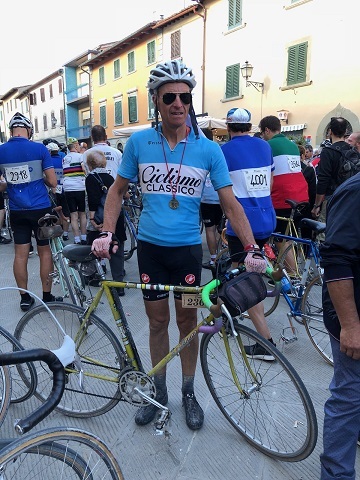 Some of our routes coincided with the route of L’Eroica, the gravel ride that was to be the pinnacle of the tour. Area road signs include permanent route markers. Every hour or so, whichever guide was driving the van would pull over and set up a rest stop. Snacks, baby! 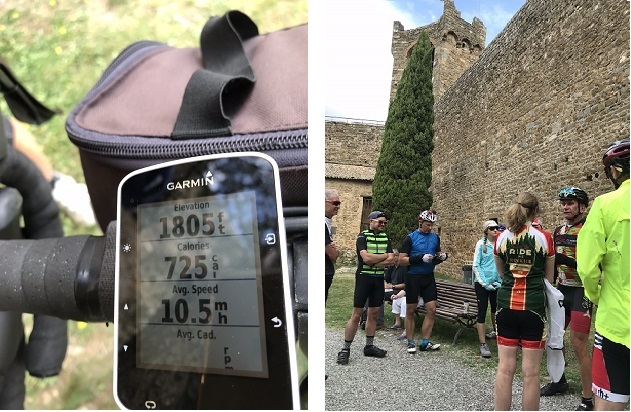 The next day, we rode to a town called Montalcino. 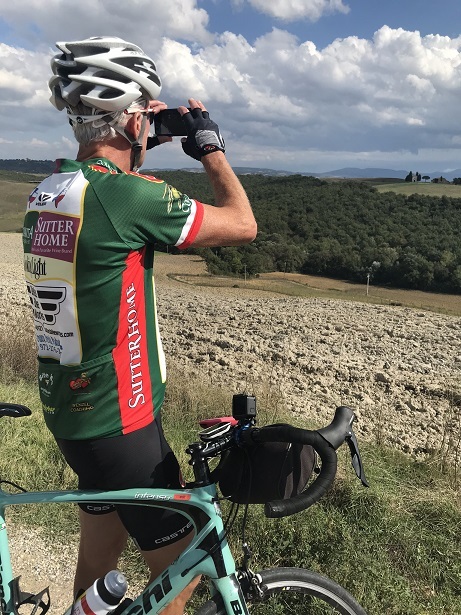 Please note: when riding to a place in Italy whose name starts with the letters “Mont-,” don’t expect the road there to be flat. As you can see from my elevation reading (below left), this wasn’t exactly a Rocky-Mountain level peak. I mean, there was air at the top, and all. But talk about steep! Our reward for that climb was getting to see this old castle (right), which our guide Marcello knew all about. 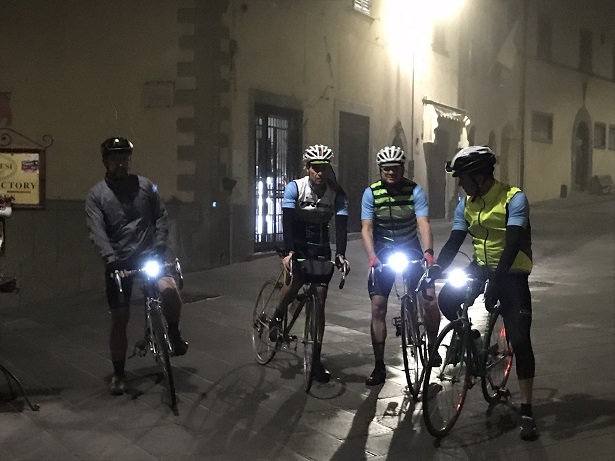 The day before L’Eroica, the group took a practice ride on their retro bikes. If you notice the third-person pronoun, yeah. I didn’t participate. By this time I’d decided that gravel roads are just not for me. No worries, that left me free to take photos and do a little shopping around the village of Radda in Chianti. Gelato may have been involved. Next morning started waaaay early. Brent bravely chose to do the long route, about 80 miles. Here he is with the other hardy souls before they rode down to Gaiole for the start. He’s the one in the middle, whose light, um, didn’t work. The guy in the middle photo was giving people old-school beard trims or, in this case, fixing up some mutton-chop sideburns. This was the greatest vacation ever. 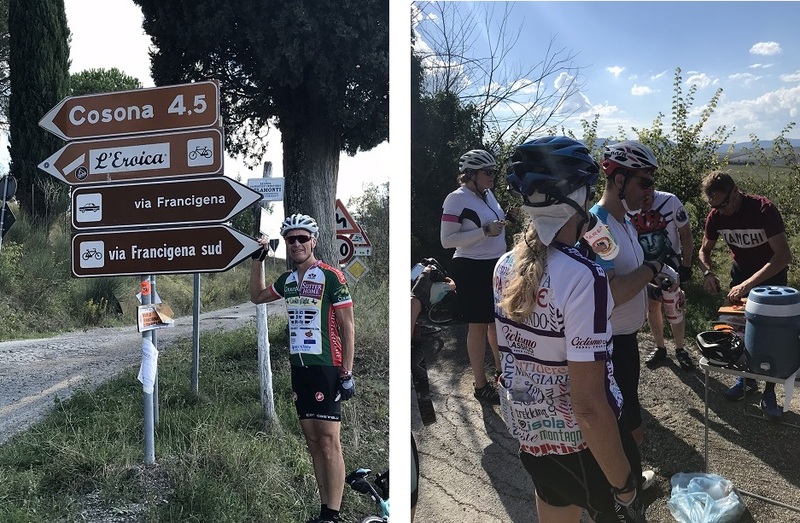 I challenged myself, rode up hills I had no idea I could climb, ate gallons of gelato, learned a lot about Italy, and made friends with some of the most charming and fun people around. 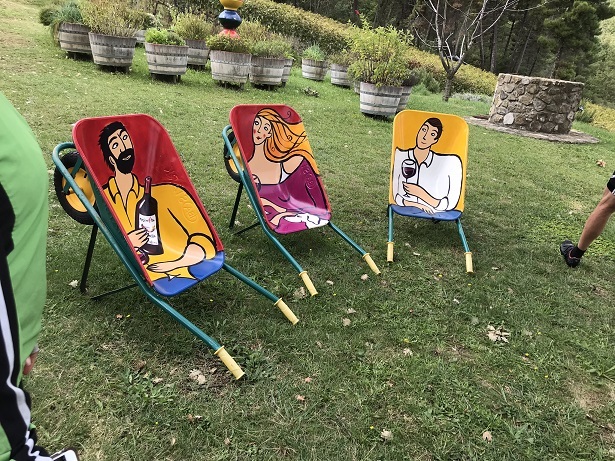 This entry was posted in I Remember When... (my OWN stories), Thoughts on Two Wheels and tagged agriturismo, bicycle, bicycling, Ciclismo Classico, gelato, Il Mollinello, Italy, Janice C Johnson, L'Eroica, Montalcino, travel, Tuscany, vineyard. Bookmark the permalink. God, I miss Europe. I cycled all over Germany and the Netherlands. Never made it to Italy. Thanks for the pics. Glad you enjoyed them. I bet the Netherlands wasn’t too hilly! Seriously, thanks for stopping by. Had not heard from you in a while. Enjoyed your trip second hand. Glad you liked it, Mom!